TORONTO – As thousands of college and university accounting students across Canada go back to school this September, their professors — Chartered Professional Accountants — are concerned about their future. Rising tuition, funding pressures and a growing “mission creep” in post-secondary curriculums, including accounting programs, are all part of a larger picture of accountability at post-secondary institutions (PSIs) in Canada. In Ontario, the provincial government is undergoing a consultation period on a new funding model and “differentiation policy framework,” after years of a growing homogeneity among provincial PSIs. Salterio is the Stephen J.R. Smith Chair of Accounting and Auditing at the Smith School of Business. He doubts the provincial government has the political will to see it through. “Quite frankly, it’s not politically popular. It won’t happen because no one is willing to say ‘no’ [to the PSIs]. The most egregious example is the bachelor’s degrees being offered in business by many of the community colleges.” He adds, however, that the issue leads all the way to the university PhD level. “One thing is really clear,” says Nainar, “in the longer term, there has to be a better way. The culture is changing. There are many pressures on universities and only time will tell how it all plays out.” To Nainar, these are “anxious times.” Universities are microcosms of the larger society and accountability is crucial. Tuitions, technology and the ROI on post-secondary education are driving that anxiety. 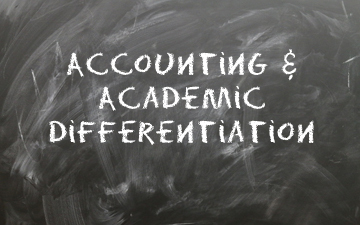 In its push towards differentiation, could Ontario shift the current, delicate balance of research track and CPA-designated professors, and ultimately harm the accounting profession? As reported in Canadian Accountant, a recent study found the profile of the typical accounting professor has changed in the U.K. It's a cautionary tale for Canadian accounting professors. The recruitment imbalance in the U.K. can be traced to a change in the university funding model, called the Research Assessment Exercise, which was implemented in the 1980s. “The RAE is part of the U.K. government’s attempt to rationalize its budgeting for post-secondary education,” says Professor Alan Richardson, FCPA, FCGA, the Odette Research Chair at the University of Windsor. It ties a certain percentage of government grants to universities to research performance. Salterio says he was once was concerned about the ability to attract professional accountants into doctoral programs simply because of the income disparity. But with the support of the profession, changes in funding models in business schools, and changes in post-graduation academic salary structure, these concerns have been alleviated. He knows of two mid-career tax managers with CPA designations that came back to university to do a PhD. “30 years ago you couldn’t think of something like that happening,” says Salterio. “They may not get tax partner salaries but they’re certainly doing as well as senior tax managers.” This newly appealing career path may provide accounting academia with a steady supply of Chartered Professional Accountants, regardless of differentiation. Is the CPA-designated accounting professor endangered?